Asian Elephant Support is delighted to offer our official logo t-shirt for $25 (postage and handling within the United States included). We appreciate the interest so many of you have expressed in the design and meaning of our AES logo. 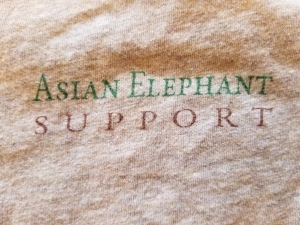 By wearing an AES shirt you will also be helping to fund programs we support on behalf of Asian elephants! Shirts will be mailed promptly on receipt of order. are human hands signifying that the future of the elephant is in our hands.